Hollister ostomy supplies enhance the quality of life for individuals who have had an ostomy surgery. 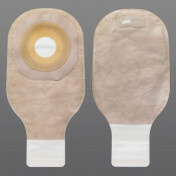 In fact, Premier Drainable Pouch, manufactured by Hollister, is a cutting-edge solution for the management of an ostomy. Providing the highest level of discretion, no one will realize that you are using this popular Hollister ostomy bag because it integrates multiple layers of an odor-barrier and crinkle-free film. For expanded odor protection, you can couple this ostomy pouch with m9 odor eliminator, too. The Premier Drainable Pouch, additionally, is especially comfortable, as it incorporates a soft fabric-like material, ComfortWear, that is attached to both sides of the pouch. 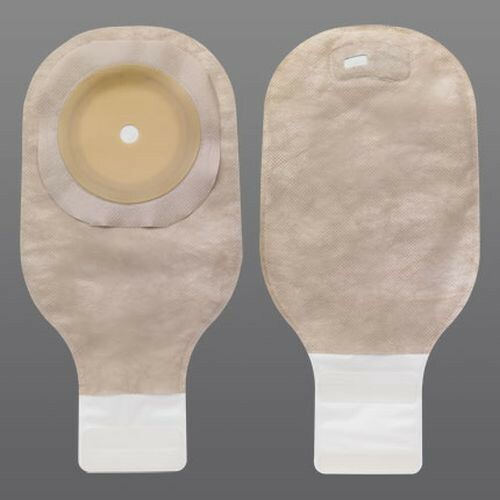 In addition to delivering unparalleled comfort and discreetness, this Hollister ostomy bag offers first-rate skin care, as it features FlexWear, a skin barrier that is systematically formulated to prevent breakdown. FlexWear technology, withstanding breakdown, is specifically designed to be worn for longer than a day, which saves you money. However, if you feel like you need an additional barrier between your skin and pouch, make sure to couple this bag with a stoma powder, as it absorbs moisture or exudate on peristomal skin. While wearing the Premier Drainable Pouch, managing the system is exceptionally uncomplicated and effortless, as it is simple to close, empty, and clean. To securely close this drainable ostomy pouch, merely roll it three times in the same direction, press from the middle out, and enjoy the security. When you're ready to dispose of the contents, though, gently pinch the sides of the leak-proof outlet for an easy-to-control flow of waste. Once you have disposed of the contents from your bag, cleaning the pouch tail is straightforward--simply wipe it with a damp cloth and you're ready to proceed with your day. When it comes to ostomy management, the Premier Drainable Pouch is the undeniable and trusted choice. Order now and see why so many individuals prefer Hollister ostomy supplies today! ComfortWear panels that offer unbeatable comfort. FlexWear skin barrier resists breakdown. 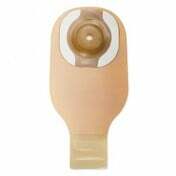 Application: To confidently and securely collect contents from an ostomy.